nell University Press, 2004. Heller, Deborah. "Cowper's 'Task' and the Writing of a Poet's Salvation." Studies in English Literature, 1500-1900 35 (summer 1995): 575-598. Huntley, Dana. "Newton and Cowper: The Olney Hymns." British Heritage 26, no. 1 (March 2005): 28-33. King, James, ed. The Letters and Prose Writing of William Cowper. 5 vols. Oxford: Clarendon Press, 1979-1986. Packer, Barbara. "Hope and Despair in the Writings of William Cowper." Social Research 66, no. 2 (summer 1999): 545. CRABBE, GEORGE (1754-1832) Born in the Suffolk seaport of Aldeburgh, George Crabbe knew poverty much of his life. His father worked collecting salt duties and could not send his son to private school, but George was educated in Bungay and Stowmarket. He learned the surgeon's craft but began to publish verse in 1772, placing a poem in Wheble's Magazine and publishing anonymously a more important piece, Inebriety, in 1775. In the latter he imitated Alexander Pope's satiric approach, focusing on the perils of alcohol. He tried to earn a living in Aldeburgh after his surgical internship but continued to read and write, with one of his favorite topics being botany. He finally decided he could never support himself in the small village and moved to London in 1780. Crabbe hoped to earn a decent wage and marry his longtime love, Sarah Elmy, to whom he had been engaged since 1772. Unable to find employment and reaching desperation, Crabbe maintained faith in his writing abilities. He decided to ask the famous philosopher and politician Edmund Burke for help. Crabbe clearly impressed Burke, appealing to him as a stranger on the verge of entering debtors' prison. Burke, who first became a member of Parliament (M.P.) in 1774, was able to use his influence to promote Crabbe. Thanks to Burke's efforts, Crabbe published The Library (1781) and then stayed with Burke at Beacons-field. There he continued writing while Burke introduced him to important individuals, including Sir Joshua Reynolds, who convinced Crabbe to consider serving the church. He agreed and took holy orders, becoming an Anglican minister. His service to the duke of Rutland as chaplain from 1782 to 1785 allowed him at last to marry Sarah Elmy in 1783. His The Village (1783) confirmed his reputation as a poet, after revision by none other than Samuel Johnson who praised the lengthy collection of heroic couplets. His next effort was a 1784 memoir of Lord Robert Manners, brother to the duke of Rutland, killed at sea. He followed that effort with a 1785 satire, The Newspaper. Crabbe wrote nothing of note for more than two decades, destroying some of his work during that time. In 1789 he moved to Muston, Leicestershire, and worked there until 1814 but took up a living at Suffolk from 1792 to 1805. At some point his wife began to suffer from mental illness. Crabbe began a second productive writing phase, publishing The Parish Register (1807), judged a fine example of verse narrative. It included the critically praised "Sir Eustace Grey" in eight-line stanzas, a poem focusing on the hallucinations of an insane asylum inhabitant, suggesting that Crabbe may have been under the influence of opium as he wrote. He published The Borough in 1810, a poem composed of 24 "letters" featuring small town life, and Tales two years later. Sarah died in 1813 after a long period of manic depression, and Crabbe fell ill for some time. He took up the vicarage of Trowbridge, Wiltshire, in 1814 and was engaged to Charlotte Ridout, but that relationship quickly ended. included Crabbe's London Journal (1817); Crabbe also published in 1817 The World of Dreams followed by Tales of the Hall (1819). He later became friends with the novelist and poet Sir Walter Scott, and the novelist Jane Austen publicly admired Crabbe's work. He continued to publish, releasing In a Neat Cottage (1822) and a collected edition of his Works (1823) in several volumes. At his death he left several unpublished pieces, which would later be published as part of the eight-volume The Poetical Works (1834). Although much of Crabbe's publishing occurred in the 19th century, his The Village, excerpts of which are widely anthologized, is a product of 18th-century sensibilities. He exhibited Augustan characteristics in his value of the heroic couplet and in his sustained focus on judgment, rationality, and moderation. While 21st-century readers may find some of his language stilted and outmoded, it remains notable for its negative tone, as well as its skill in form. Crabbe's realistic pessimism contrasted with the traditional idyllic approach to rural description, such as that found in work by his predecessor William Cowper. He introduced originality in his unrelenting investigation of the tension between the suffering of poverty, which he knew all too well, and the supposed ideal of country living. In 1945 an opera titled Peter Grimes was produced with a prologue based on Crabbe's The Borough. The term E-book can mean a variety of different things in varied context however the most basic reference would be that it is a source of information done in a digital file. 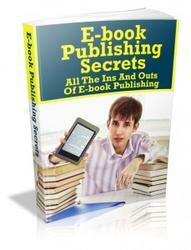 This book gives you the tools to publish yourself.